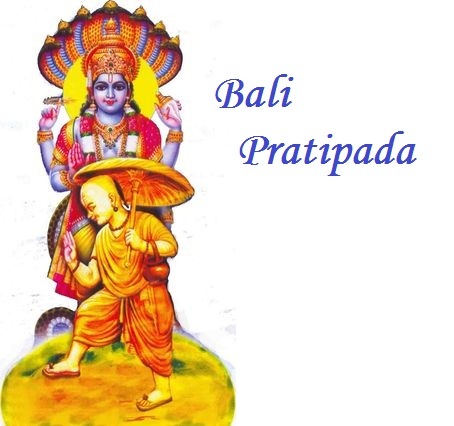 Bali Pratipada (Diwali Padwa) is the third day of Deepavali. It is celebrated in honour of the notional return of the demon(Daitya)-king Bali to earth. It is also called the Akashadipa (lights of the sky). According to Hindu mythology, Bali Padyami commemorates the victory of god Vishnu in his dwarf incarnation Vamana, the fifth incarnation of the Dashavatara (ten major incarnations of Vishnu) defeating Bali, and pushing him to the nether world. But Bali was bestowed a boon by Vishnu to return to earth for one day on this day to be honoured and celebrated for his devotion to the Lord and for his noble deeds to his people.